A beak with a duck attached to it, would be a nice description for the Shoveler. With its long beak,head down, it sifts food out of the mud and the water. Although it looks a little clumsy, the bird itself is slender and a good flyer. 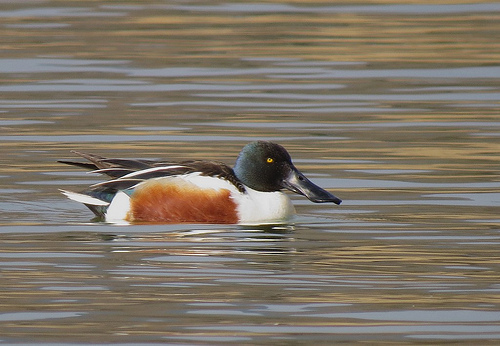 Other duck species are in western Europe only in winter but the Shoveler likes breeding here. The huge bill is distinctive for the Shoveler. It is striking both on the water or flying. The Mallard has a normal-sized bill. 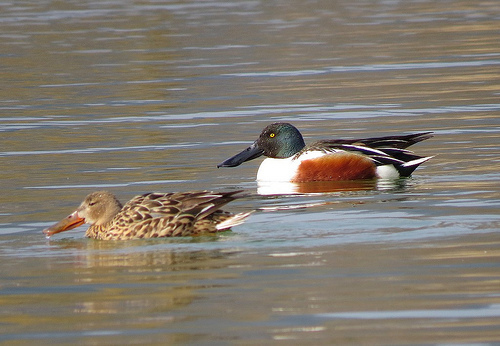 With the combination of white, brown, and green the Shoveler and the Shelduck have some resemblance. The Shoveler has a very large bill. The Shelduck has a normal-sized, bright-red bill.